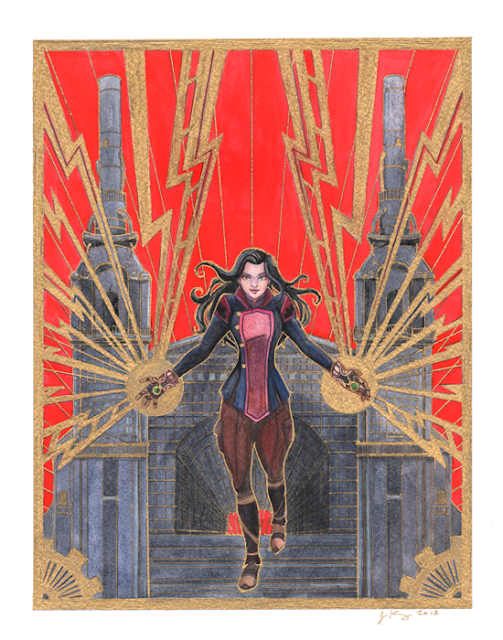 This is my piece for the Legend of Korra art show, 'I'm the Art Show, Gotta Deal With it!' I adore Legend of Korra and when I first head about the show, I immediately signed up, then struggled for ages to come up with a good idea for a gallery piece. At first, I thought I'd do a sort of hero drawing with all of my favorite hero characters together (Korra, Lin, Asami, Jinora and Ikki), but then I started drawing parallels between Art Deco and the designs of the Sato mobiles, as well as the various Sato inventions. With Asami taking over her father's company in the new season, I thought it'd be fun to illustrate it how while still a Sato, she's different from her father. The piece was drawn in Photoshop, then printed out on watercolor paper, painted with gouche and watercolors, and inked with Sharpie paint pens in gold metallic.